So, I have my UM3ext since 3 months now and it worked just fine until the past 1weeks, each time I try to print, it tells me : "this printjob is not suitable for this printer" I need to press ignore about 6 or 7 times so that the message dissapears. then it will say the print is to big for the printer. After, it starts preparing for the print, sometime, it will say heating the bed, and when I look at the target temp, it' 0, so it will just stay like this forever. Some other times, it try to do the active leveling, and the printbed goes up and down for 2mins until it says ER22 or ER26 ! I'm printing with the same settings and same filament than usual, I tried printing an old Gcode that worked before the problems started, doesn't work ! If you want the printer not to complain then you need those above 5 things to match between the printer and the slicer. It's okay to lie a bit. For example if you have ABS in the printer but you sliced for PLA you could tell the printer that PLA is loaded. I don't know why you would do this but it would get rid of one of the warnings. Let us know which of these 5 things (or another?) doesn't agree that you can't get rid of and we can help you get rid of the annoying message. So it's all good on the bug part, but because myprinter lovesproblem, the bed screws (the ones you turn to calibrate height) decided to take vacation and just pop off, resulting in bad things going on in the extruder, see in the photos, the whole thing is filled in Nylon !! ! 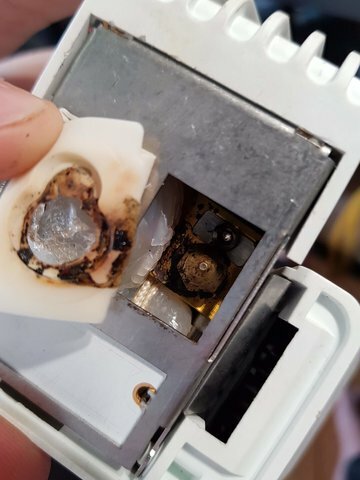 This is when i regret the metal of the UM2, it happened to me one time, just get the heat gun, kinda messy, but cleams up ! on the UM3, because it's plastic, can't do anything, so if you have a tip ! what temperatur , I'mkindascared to melt the plastic because nylon is 255°C, one of the highest temp, or maybe they usespecial heat resistant plastic... If someone knows ? You are not really trying to melt it, but soften it. But maybe start a bit below that and see what happens. Notice that the plastic was not damaged. The silicone pad was, but not the plastic. Just focus on the nozzle. Of course, my heat gun has a tip that limits how wide the airflow is. That must be a wide nozzle on your gun. You should call your reseller because they might be able to help you for free. Although you may have violated your warranty at this point (for this particular issue. I really don't know how that works so I'd contact them right away. Anyway you need the nylon to get to about 150C so that it is soft enough to pull it all off. If the core still works heat that to 200C and let it sit for maybe 30 minutes, then start with the heatgun as necessary. It takes dozens of minutes for that heat to penetrate enough to start removing chunks so go easy and slow. You went much too hot. But I doubt you caused any permanent damage yet. Looks mostly like discolouration to me. 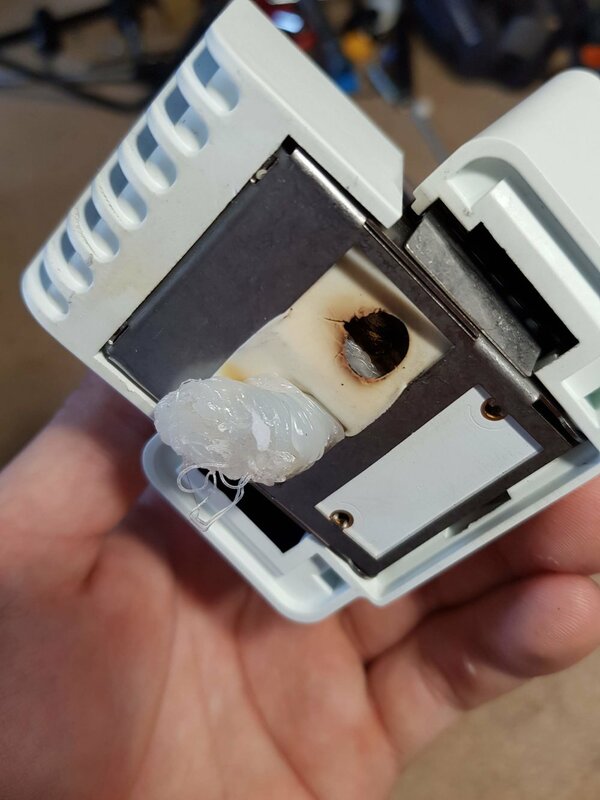 i'm going to try this out right now, hope the heater cartridge still works because, the printer had an error message that said heater cartridge prob ! sorry for late respons, didn't have time to do it till now ! i think the nylon actually push a little the print core and went beetween the contactes pins on the PCB and the print cores ! ER15 is a heater error; if the printer can't increase the temperature by X number of degrees in Y seconds (or maintain X temperature across Y seconds) it will present a heater error. Because the printhead is covered in filament, that filament is absorbing the heat that your printer is trying to pump into the brass, so it seems like it can't get to temperature because it's trying to heat too much material. Alternately, it's possible your heater wire is damaged, which would also cause the error. 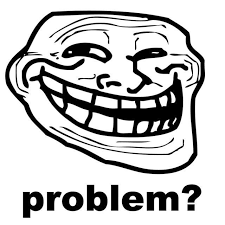 Regarding the bed screws falling out...that was probably the effect, not the cause of the issue. Was your active leveling on? If your active leveling is on and you active leveled before the print active leveling will only work if the springs and screws are already pretty tight, which makes them unlikely to fall out. 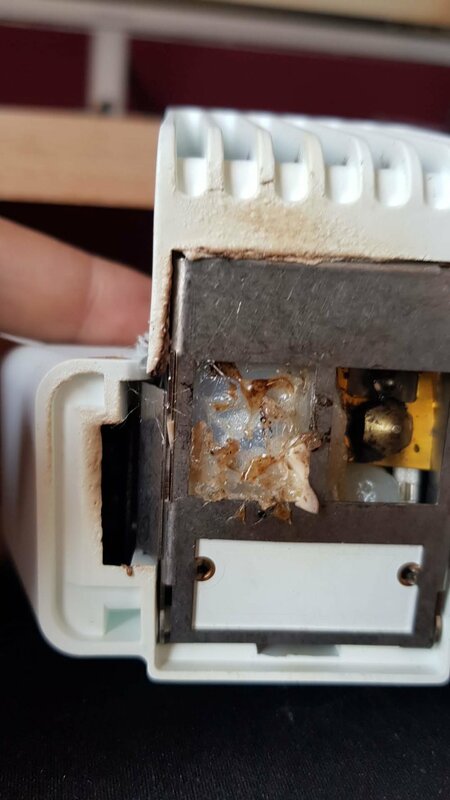 However, if your print comes off the bed and goes into your printhead like it looks happened in your case, the hanging down part can hit the bed enough to make the screws loosen and fall out if unattended for a long time. the active leveling was off because i couldn't manage to start a print with it, error each time ! even if I leveled the build plate manually ? After searching on the forum for similar issues, most of the people trying to repair this mess breaks the printcores, if not the entire thing ! I'm contacting my local resselerfor support this afternoon ?